Our white magnetic sheeting comes in a variety of thicknesses, widths, lengths (by the roll or per metre), and has a gloss white PVC coating. White side is non-magnetic. It is constructed from Strontium or Barium ferrite powder within a polymer matrix. This white magnetic sheeting is manufactured to provide good demagnetization resistance & reasonable resistance to chemical agents. It can be stamped, slit, punched or laminated, providing a superior product for magnetic signs at your office, warehouse or home. It can be easily cut with guillotine, scissors or cutter knife. Magnetic sheets are ideal print media matching the specific needs of Point-Of-Purchase display. 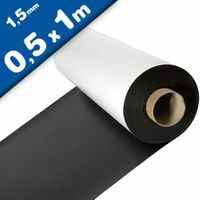 Our white magnetic sheeting comes in a variety of thicknesses, widths, lengths (by the roll or per metre), and has a matte white PVC coating. White side is non-magnetic. It is constructed from Strontium or Barium ferrite powder within a polymer matrix. This white magnetic sheeting is manufactured to provide good demagnetization resistance & reasonable resistance to chemical agents. It can be stamped, slit, punched or laminated, providing a superior product for magnetic signs at your office, warehouse or home. It can be easily cut with guillotine, scissors or Stanley knife. Magnetic Sheets are very adaptable, versatile and the best alternative when you require a cost effective flexible magnet for your office, factory, warehouse or home. Our Flexible Magnetic Sheeting can be used for a variety of applications such as promotional magnets, invitations, business cards, identifiers, car signs, craft, arts, general hobbies and many other commercial purposes. Magnetic Sheets from AMF Magnetics, have a PVC coating suitable for various kinds of printing as well as writing on with whiteboard markers. 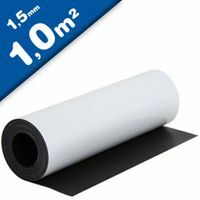 Buy Magnetic Sheets and Sheeting by the roll or per metre! Sheet magnets are one of the most inexpensive magnets that are available in the market. These magnets are smooth, nonporous and are all weather resistant. The strength of the magnets can be increased by either increasing the width of the sheet or through magnetizing method. Anisotropic flexible rubber magnets are made by mixing ferrite magnet powder with synthetic rubber or plastic. When barium or strontium ferrite powder are consolidated with polymer matrix, anisotropic flexible rubber magnets are produced. The magnets so produced, have an excellent flexibility in permanent magnetic material field. These magnets because of their flexible feature can be easily molded and cut into stripes without affecting their magnetic properties. They also have an excellent machining characteristics. Flexible magnetic sheeting is available with a variety of high quality laminates that are typically applied to the non-magnetic (weak) side. The most frequently used laminates are vinyls or adhesives depending on the required function of the magnet. 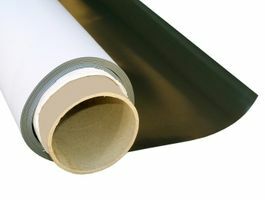 Flexible Magnetic Sheeting is used for vehicle signs, creative projects, promotional items and many more consumer and commercial applications.We carry a a large stock inventory of flexible magnetic sheeting in different thicknesses, in rolls of different lengths, and with either white or plain brown finishes. Flexible magnets are ideal for indoor & outdoor signs, warehouse labeling, vehicle signs, displays, visual aids, toys, games, arts & crafts, advertising premiums, POP displays, architectural planning layouts, bulletin boards, trade show applications and more. If needed, we can custom slit rolls or custom cut the sheets to your desired length. Rolling Magnetic Sheets: The rolling magnetic sheets are powerful magnets which find their usage for large-scale advertising ornaments, toys and diversified craft works. Cutting Magnetic Sheets: The cutting magnetic sheets have their utility for instruments, meters, sensors, advertising ornaments, toys and different kinds of craft-work. Calendaring Magnetic Sheets: The calendaring magnetic sheet too like rolling magnetic sheet is used for advertising ornaments, toys and various craft works. Plain Magnetic Sheets:These magnets are without any laminations. Colored Magnetic Sheets: They are laminated with colored vinyl (PVC). Self-Adhesive Magnetic Sheet: They are laminated with self-adhesive tape. 1.6 for more holding strength. Magnetic Labels: Everything you need for magnetic labels, including pre-cut and write-on / wipe-off options. Matched Pole Strip: Apply magnets face-to-face or even side-to-side without worrying about aligning the poles! Magnet Receptive: We offer magnet receptive foil tape, lightweight metal sheet with paper surface and even printable ferrous sheet! Magnetic Strip: Our magnet strip is available in rolls or pieces, plain, with adhesive, or with color laminates. High Energy Magnet Strip: A stronger version of our standard magnetic strip, made in energy levels of 1.0 to 1.6 for more holding strength. Application should be made onto a flat, dry surface, after first removing any contaminants such as dirt or oils. Avoid extreme heat or cold, which could impact PSA flow. Apply with firm, equal pressure – 12 hours of pressure is recommended to obtain optimal flow and adhesion. The magnetic properties of the flexible rubber magnets are higher than that of sintered isotropic ferrite magnets. It is easy to give desired shapes to the magnetic rubber as the punching, cutting, perforating and bending are easy and simple. Magnetic Sheets/Rolls is a permanently magnetized, synthetic, rubber-based material which has countless applications in the signage and graphics industries. Magnetic sheeting is the perfect solution to semi permanent advertising applications. Magnetic sheets are best suited for: Advertising Displays & Signs, Motors, Sensors, Learning material, Decoration magnets for refrigerator, Magnets for toys, Vehicle signage, Labeling projects shelf and bin marking, Arts and Craft and toys, POP displays, Markers, Business Card Magnet, Advertising Boards, Advertisement, Window and Door Seals, Control Charts and Menu Boards, Package closures, Large Format & Interchangeable Graphics, Magnet Wall Systems. Easy on! Magnetic sticks easily to metal surfaces. Easy off! Just pull- no damage to surface. Use again and again and again. Easy does it! Screen print or paint. Cut your design with a sharp knife or scissors. Who supplies high quality Plain Magnetic Sheets? Magnosphere offers best priced Plain Magnetic Sheets globally to all industries, including Automotive, Aerospace, Military, Advertising, Design House, Electronic and Academic/R&D. Please inquire for custom Neodymium magnets or magnetic assembly. 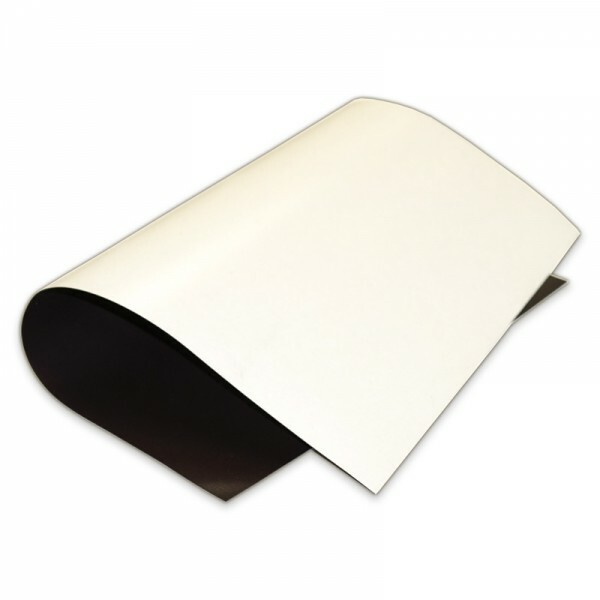 Buy Plain Magnetic Sheets at Magnosphere and get a better deal!